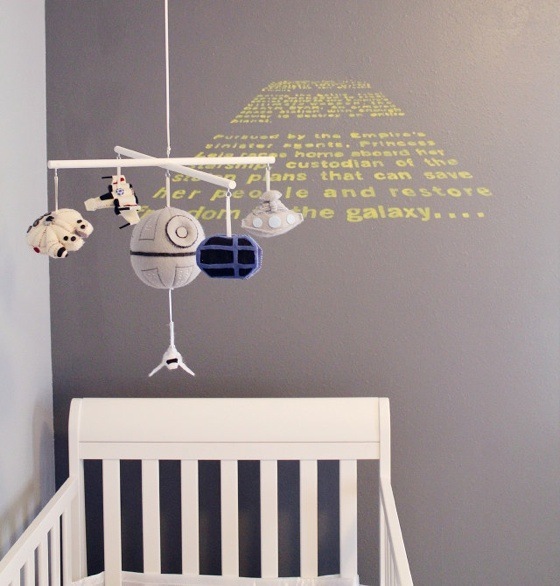 There’s a mobile, which is clearly the centerpiece of this room; A custom pillow made with their sons name using Star Jedi (the Star Wars font); A picture of Han Solo, a C3PU lamp and the opening wall of text painted onto the wall. I think my personal favourite part of the whole thing is the stuffed x-wing for the mobile. But I’m also pretty partial to x-wings in general. You can also find a post about it on Moms Blog. My Son’s handmade mobile. I designed all the ships and cut the felt but the sewing was outside of my skill level. thankfully my mom is amazing and did it for me.